1961. 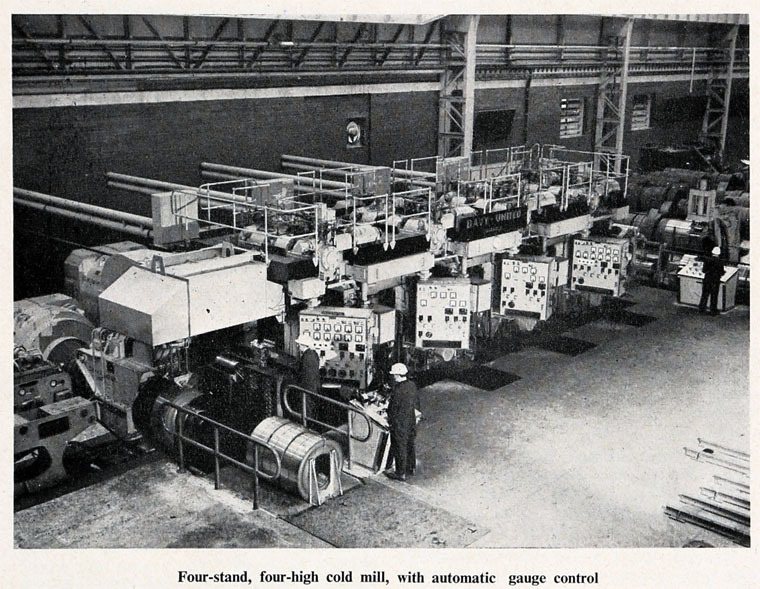 Four-stand, four-high cold mill. 1966. 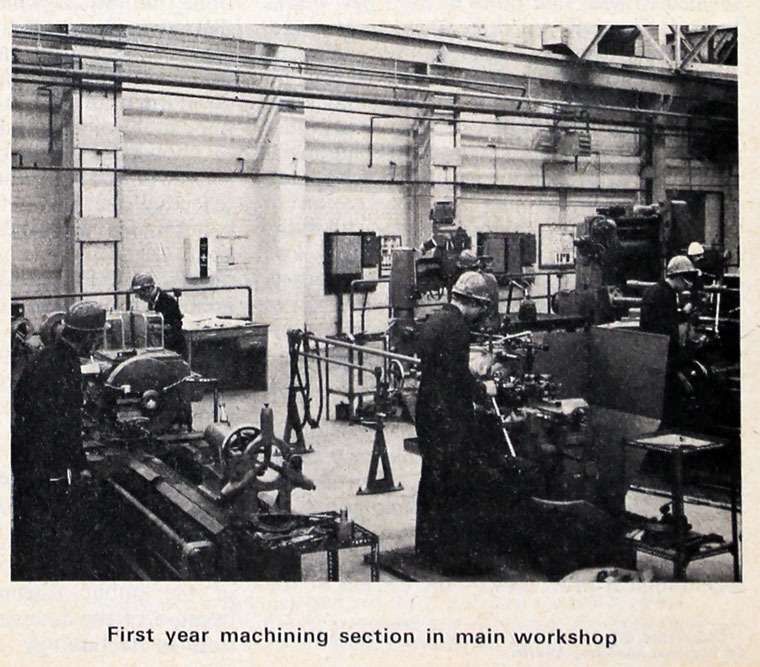 First year machining section in main workshop. 1966. 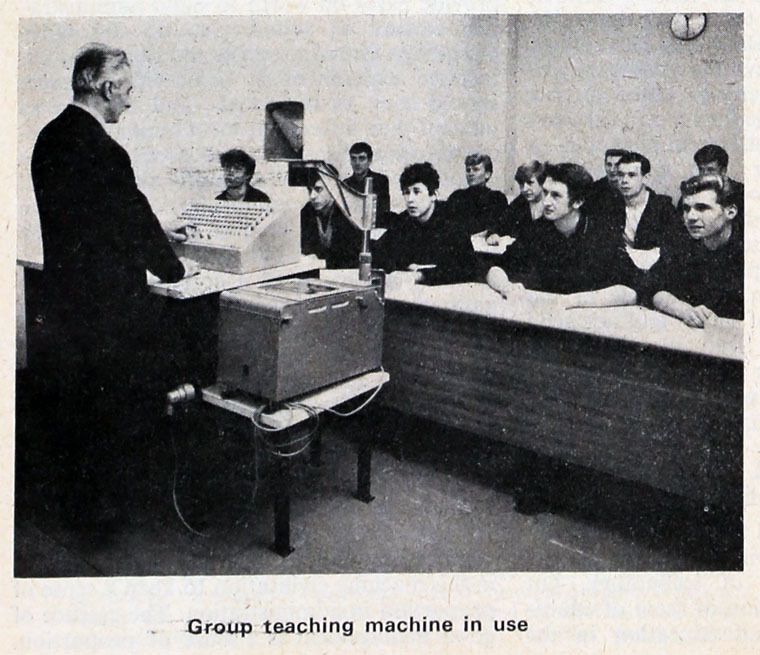 Group teaching machine in use. 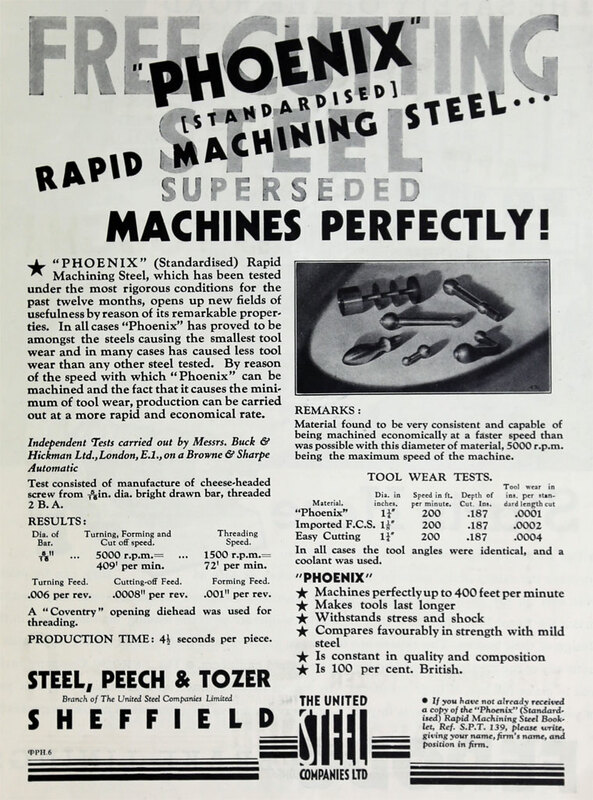 Steel, Peech and Tozer was a large steel maker with works situated at Ickles and Templeborough, in the Don Valley, on the outskirts of Rotherham, South Yorkshire. An area of land, almost a crescent shape through Masbrough and Ickles, on the edge of the town of Rotherham, became well known in the late 18th / early 19th centuries through its involvement in iron and steel making and there could be found the works of many of the towns iron masters. Situated between the main turnpike road linking Rotherham and Sheffield and the River Don, the Phoenix Works was a leading manufacturer of large iron forgings, made using water powered tilt hammers. 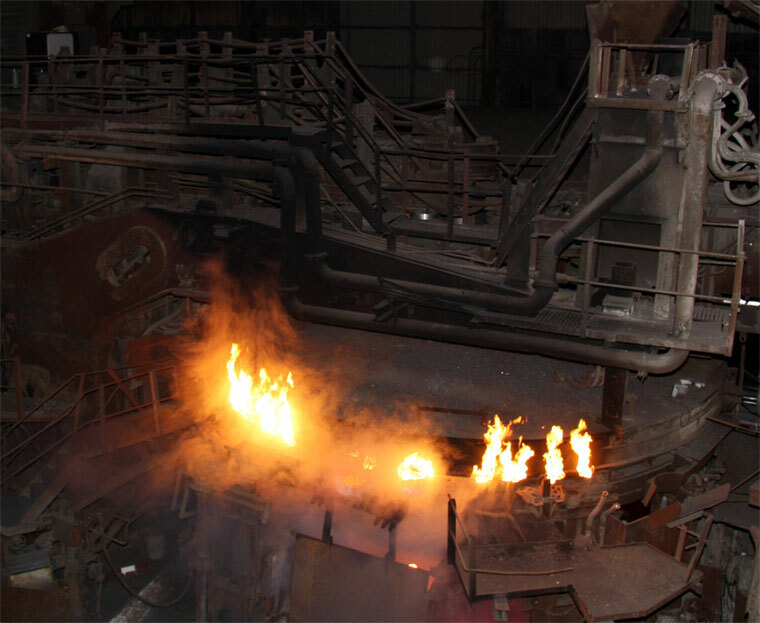 It is known that the works made forgings for marine engines, shafts for use in paddle steamers and crank axles etc. 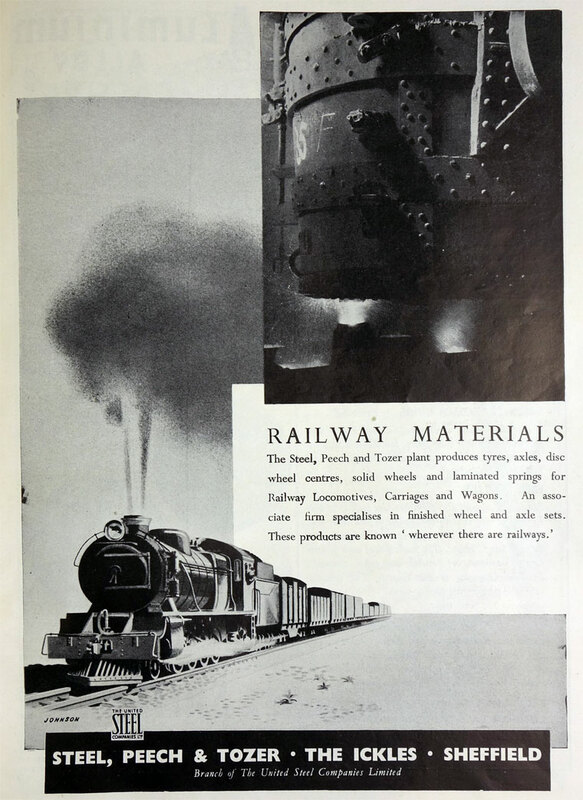 The business was then almost solely confined to the manufacture of rails, and in the early forties, the days of the great railway boom, manufacturers of railway material were doing well. But a serious slump followed, and one of the firms which had to suspend operations was the Phoenix Works. 1872 Thomas Hampton and William Radcliffe acquired the works, changed the product base, and gave it name of the Phoenix Bessemer Steel Works, making steel through the use of the Bessemer process. 1875 The company failed and the assets were purchased by Henry Steel, Senior with William Peech and Mr. Hampton. The price paid for the establishment, tools, and plant, was something under £50,000, and a limited company was formed with a capital of £70,000. 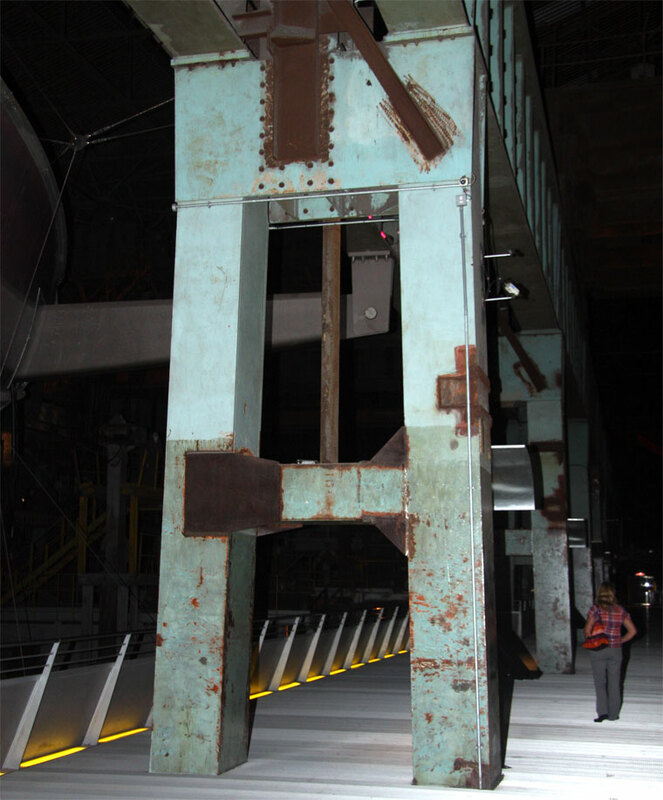 The new company became known as Steel, Peech and Hampton, taking its name from those of the directors. 1883 Mr. Hampton left and was replaced by Edward Tozer, the company changing its name to Steel, Peech and Tozer, a giant in South Yorkshire steelmaking had arrived. 1897 The steel making plant was changed when the Bessemer converters were replaced by three Open Hearth furnaces and the processing plant increased with the addition of cogging mills, rail mills and specialist plant for the manufacture of steel springs and railway axles. WWI following the outbreak of the First World War, many iron and steel companies began producing munitions. In this case the work was added to the normal production, which included many component orders for the military. 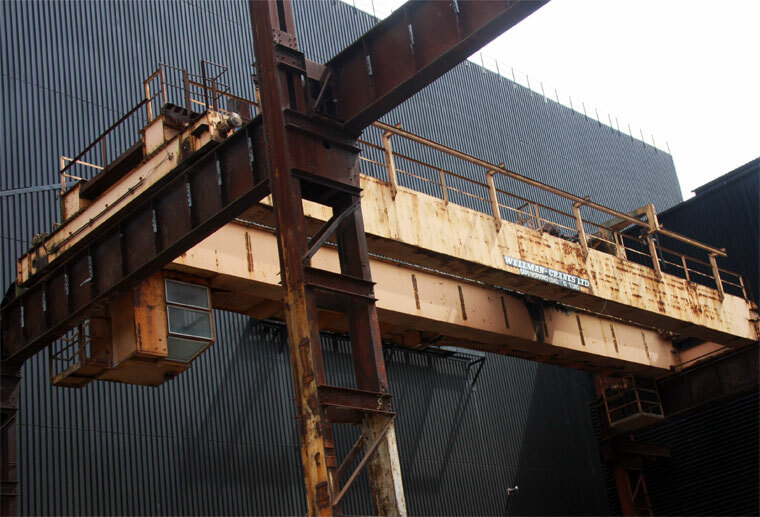 The Ickles site was proving too small to handle the production, and with steel in such demand, the company extended their works towards the Sheffield boundary, to occupy a site between the main Sheffield to Rotherham road and the Great Central Railway line. The new Melting Shop and Rolling Mills were built over the site of the old Roman fort at Templeborough. The Templeborough Melting Shop, when opened, was the largest melting shop of its type in Europe and contained 14 open hearth furnaces where steel scrap was melted down. 1918 Following the end of hostilities, Steel, Peech and Tozer joined with Samuel Fox and Co of Stocksbridge and Appleby-Frodingham Steel Co of Scunthorpe to form United Steel Companies. "It was the introduction of the Bessemer method which was virtually the foundation of the undertaking, which was originally styled Steel, Tozer and Hampton, and rails for British and foreign railways and merchant bars were manufactured. In 1883 the title was changed to its present one, and the success which had followed the rolling of rails was an incentive to develop the making of further railway material. 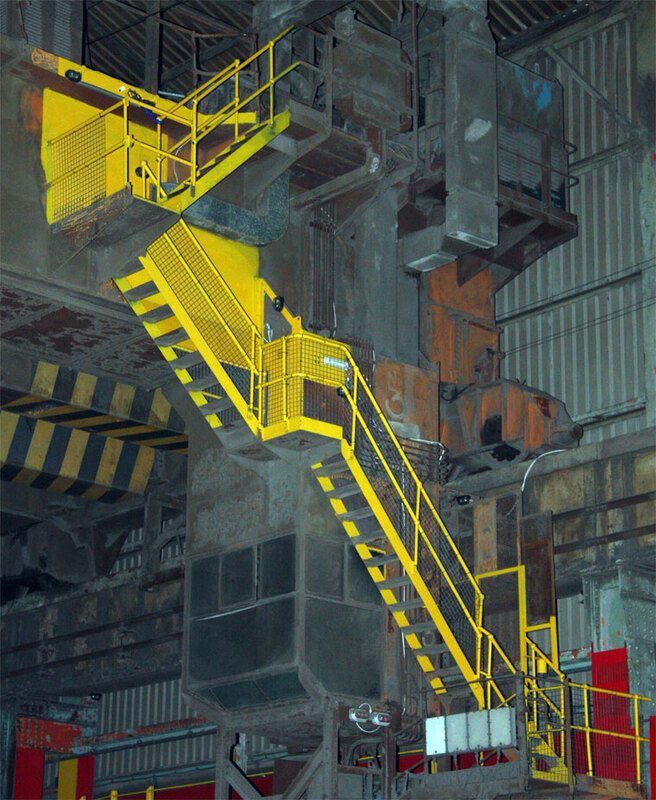 The introduction of the Siemens acid furnaces to supplement the stool output dates from 1892, and the firm entered the basic steel trade in 1906. 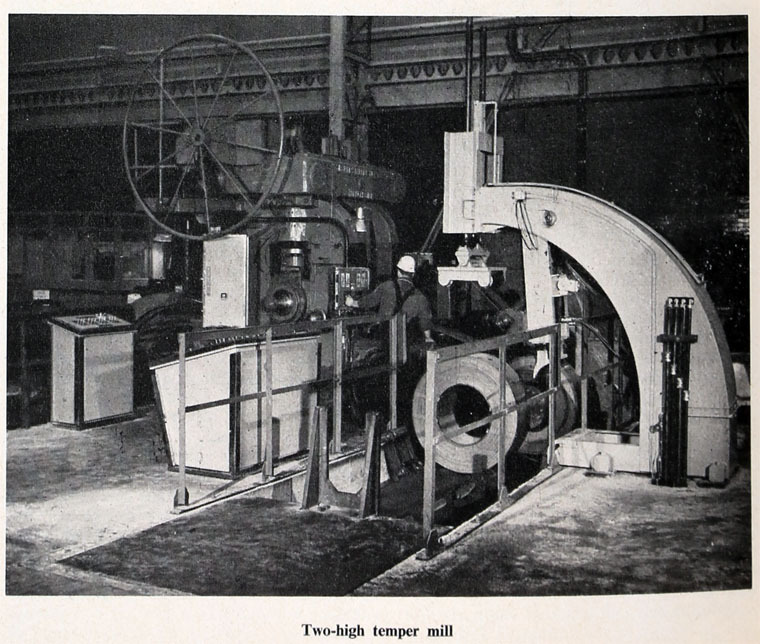 At the Templeborough works there is a plant for rolling billets and slabs which is not excelled anywhere in America or Europe. 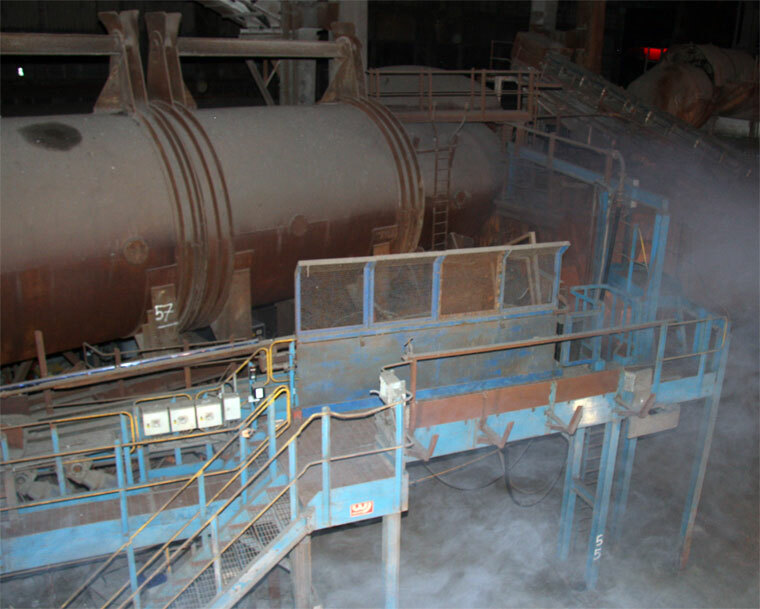 The melting plant consists of fourteen 60-ton open-hearth basic furnaces, and all the lay-out for dealing with the steel is on an equally extensive scale. Electricity has been brought, into use for mill driving and other purposes. 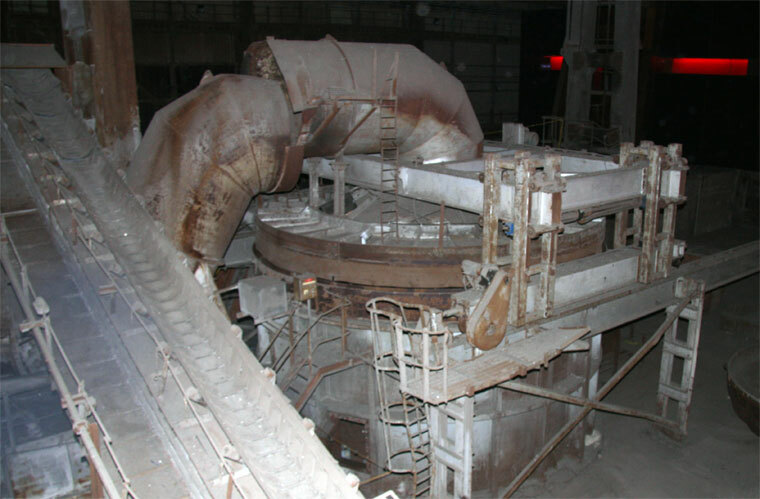 Steel, Peech and Tozer are grouped with the United Steel Companies." During World War II, again, many iron and steel works produced munitions for the war effort, not only munitions but sections for the construction of Bailey bridges, an important assistance to the Allied troops in Italy and following the D-Day landings. Because of its size and known war effort involvement the Templeborough was a prime target for the Luftwaffe. Post-WWII. After the end of WWII, many industrial companies in South Yorkshire faced problems due to the decline in the need for their products. 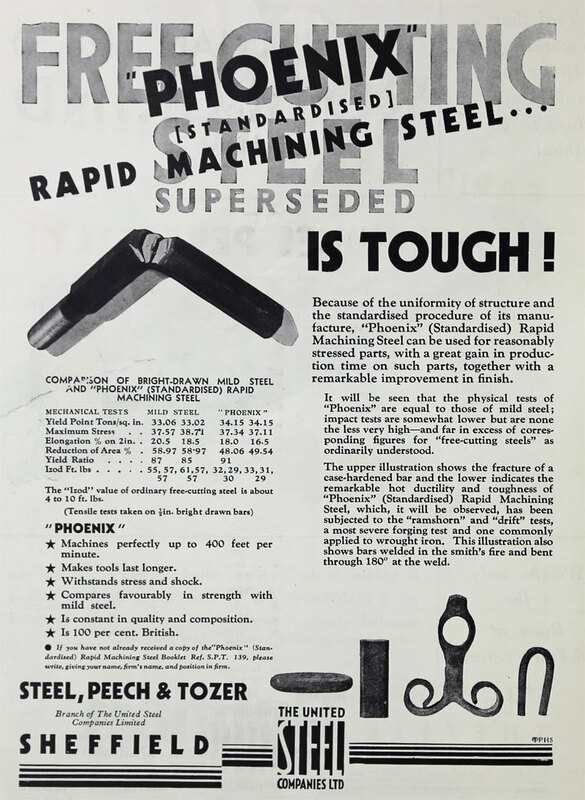 United Steel Companies, with the other large steel producers in the United Kingdom, was nationalised in 1951. Two years later the steel companies began to be de-nationalised. 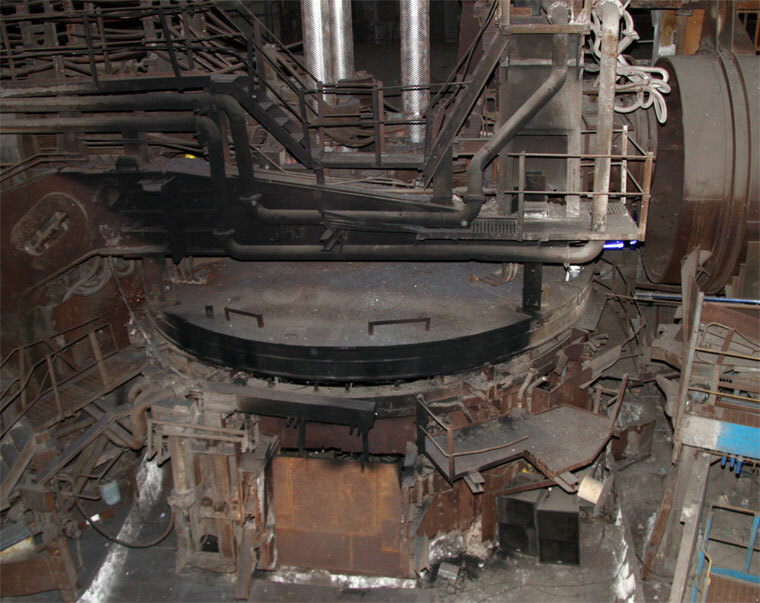 By the 1950s, Templeborough's open hearth furnaces were in need of replacement and the United Steel Companies set about the task of updating its melting facilities. 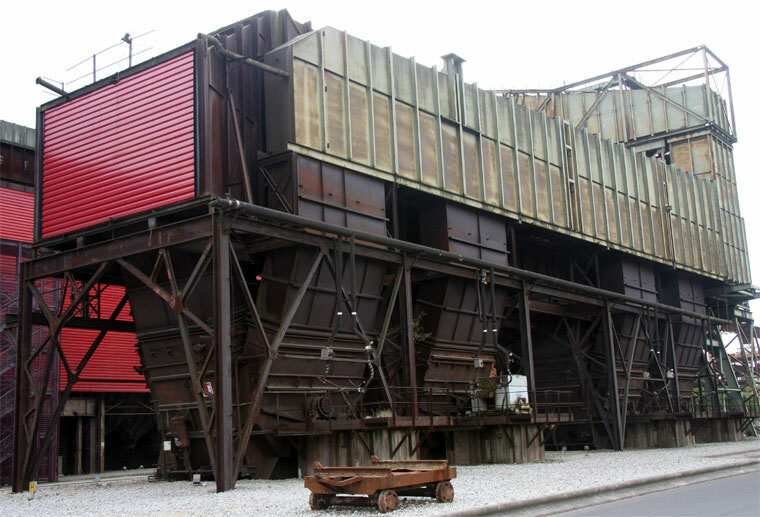 Plans, under the name “Operation SPEAR” (Steel Peech Electric Arc Reorganization), brought the most modern electric arc furnaces to the company, six of these replacing the 14 open hearth furnaces. When completed Templeborough Melting Shop became the world's largest electric arc steel making plant with a capability of producing 1.8 million tons per year. 1967 Nationalised again in 1967, the works became part of British Steel. It was yo-yo time within the industry. 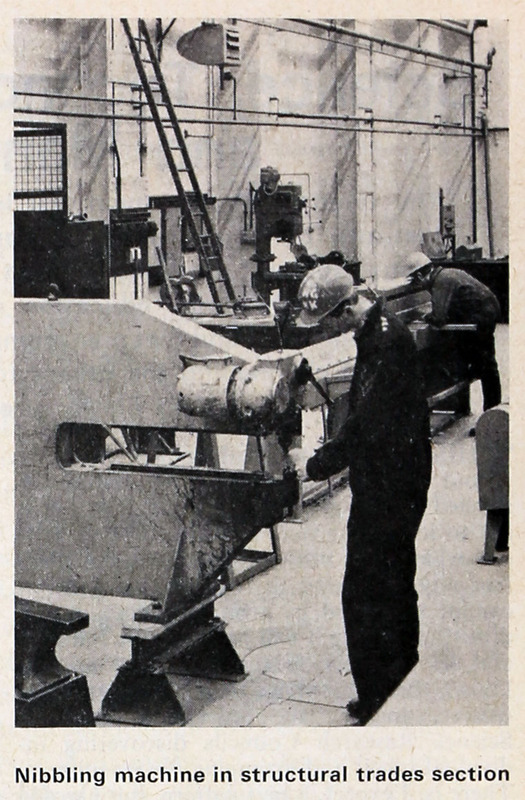 Later the works was privatized and became known as Rotherham Engineering Steels, returning to become part of British Steel again. 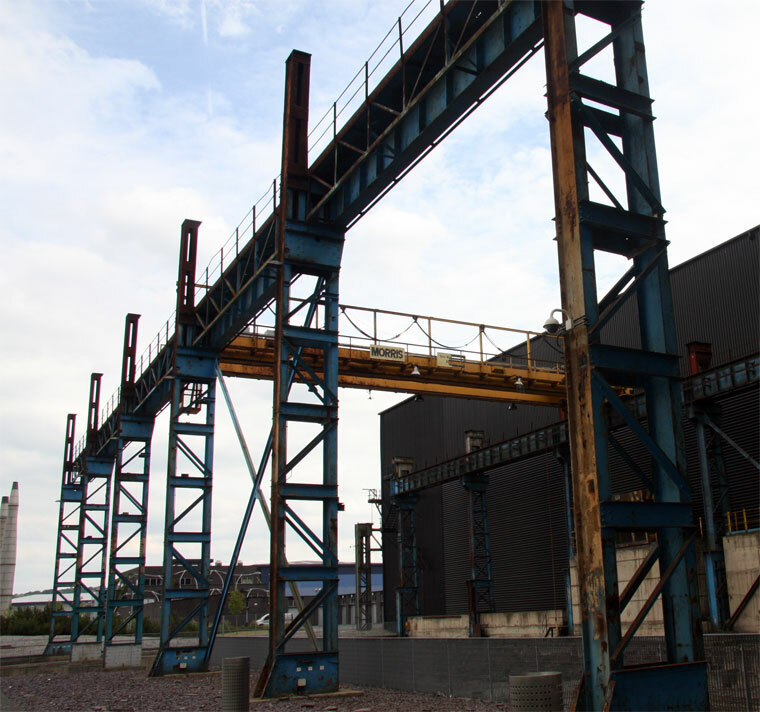 With the installation of a continuous casting machine in the early 1980s there was something of a revival in the fortunes of the works, however, this was only to last for 10 years, the giant works melting its last in 1993.